Venice is one of those idyllic cities where you feel like you have just stepped into a nineteenth century painting. Drink: Stop by Harry's Bar in Piazza San Marco, the birthplace of the Bellini, and sip a splendid aperitif of Prosecco and white peach puree, and perhaps sit at the table where Ernest Hemingway spent much of his time during the winter of 1949. Too early for a cocktail? Try instead a cake and the "Cioccolata Casanova," mint cream hot chocolate, in the longest continually open café in Europe, Cafe Florian. Eat: Simple ingredients can create incredible feasts. Off the beaten tourist path in an artsy corner of Venice is the Paradiso Perduto restaurant and jazz club. For two, order the seafood platter and the most decedent homemade macaroni and cheese you've ever tasted. Not only will your hunger be curbed, but you’ll be delighted as the sous chef pushes a cart to your table and tosses freshly cooked macaroni into a cheese wheel as wide as a barrel and finishes the dish with a sprinkle of crushed black pepper. 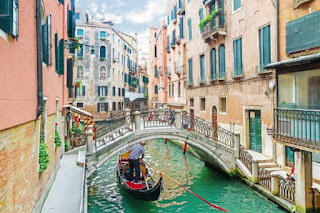 Visit: While there is plenty to see and do in Venice itself, why not jump on ferry boat or water taxi to explore its famed archipelago. The small island of Murano is world renowned for its glassware. Whether you are in the market for a sculpture, a set of champagne flutes or a paperweight, you’ll find it here and you can also partake in a free glass-blowing demonstration at one of the many galleries on the island. A stone’s throw away, is the quaint fishing village on the island of Burano. One of the most-photographed spots in Italy, you’ll get lost in the rows of colorful buildings and be beckoned to the shops hawking handmade lace tablecloths and embroidered scarfs. Make it a day trip and purchase a 24-hour ferry ticket before you leave Venice. Enjoy: Who says the opera has to be stuffy? Book a reservation at the Musica a Palazzo and enjoy a traditional opera in a contemporary venue. Follow the actors through a 15th century palace on the Grand Canal as they perform in three unique halls and be brave enough to grab a seat in the middle of the show. One visit to Venice is not enough. So the next time you go, take in the sights, smells and tastes of this majestic city, and truly get lost in its allure.